Students from grades Pre-K and K participated in a warm up activity. Divide class into 4-8 groups in I-formation. First person on each team will have a modified noodle baton. 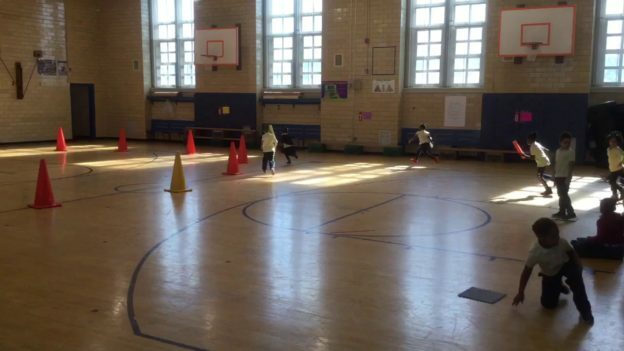 At opposite side across the gymnasium, set up large cones in a 25-30ft diameter circle. On go, students run 1 lap counter clockwise on the outside perimeter of the roundabout. After completing a lap, students return back to their assigned group and handoff to the next person in line. Remind students as they enter the crossover area to be aware of oncoming runners when making the exchange to avoid a collision.